Hello…I hope your day is moving along splendidly. I just came across this great website called Give Tree Gifts, which I am so pleased to share with you. 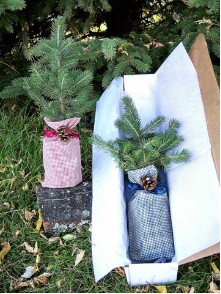 This Saskatchewan business offers a whole range of green gift ideas, but what strikes a cord with me is the tree seedling gifts. There are so many special occasions that would benefit from such a thoughtful gift, from party favors to Earth-day celebrations. The one I fancy, is the use of tree seedlings as wedding favors for couples wanting a more eco-friendly day…I love it! Such a beautiful way to start their lives together. Their wedding favors don’t just end up in the garbage but they provide benefit to the earth and all the people who encounter it for years to come. Couples are also able to have a carbon neutral wedding done in partnership with The Carbon Farmer. So neat I wish I’d heard of this when I got married! Give Tree Gifts also sells some great resource books for couples planning a green wedding. Please check out the story behind Give Tree Gifts and how it started with a memorial to her father, it’s beautiful. This entry was posted on Tuesday, March 6th, 2012 at 5:41 pm	and is filed under Uncategorized. You can follow any responses to this entry through the RSS 2.0 feed. You can leave a response, or trackback from your own site.